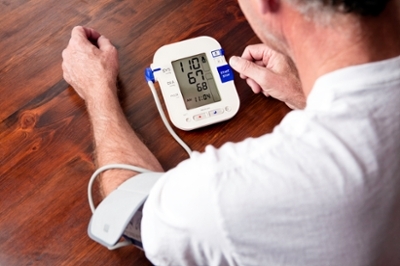 New research shows that for people with high blood pressure, reducing systolic blood pressure (the top number) below 120 mmHg can reduce risk for mild cognitive impairment (MCI), an early stage of dementia. Previous reports have shown that intensive blood pressure control reduces risk for heart attacks, stroke, and death. Now, an extension of this work, called SPRINT-MIND (Systolic Blood Pressure Intervention Trial - Memory and Cognition in Decreased Hypertension), demonstrates that the treatment benefits the brain as well. The research published on Jan. 28 in the medical journal, JAMA. MCI is characterized by problems with memory, thinking and judgement that are more pronounced than those caused by normal aging, but less serious than dementia which impairs an ability to carry out daily activities. While this study demonstrated that intensive blood pressure control mitigates MCI, it did not have a statistically significant effect on dementia. However, the study’s authors point out that the result could stem from the small number of dementia cases documented during the trial. SPRINT-MIND investigators will be monitoring study participants for another two years in an effort to determine whether treatment also delays the onset of dementia. SPRINT randomly assigned over 9,300 participants one of two blood pressure targets: less than 120 mmHg or less than 140 mmHg. Participants were age 50 years or older, at increased risk for cardiovascular disease, had a systolic blood pressure of at least 130 mmHg, and did not have diabetes or history of stroke. Blood pressure was adjusted with antihypertensive medications. For SPRINT-MIND, participants were given cognitive assessments at the start of the trial and then every two years and classified into one of three categories: no cognitive impairment, MCI, or probable dementia. SPRINT was stopped early due to the success of the trial in reducing cardiovascular disease. The trial’s reduced timeframe may have made it difficult to assess interactions between intensive blood pressure control and dementia. University of Utah Health nephrologist Alfred Cheung, MD, led a network of 17 of the 102 clinical sites that participated in the SPRINT clinical trial. University of Utah Hospital was a participating clinical site. University of Utah Health neuropsychologist, Gordon Chelune, PhD, also served on the trial’s cognitive outcome adjudication committee.